Described as an ‘assault on the senses’, fans around the Mountain Course were again treated to the sights, sounds and unique 'Castrol R' smell of some of the most iconic historic bikes as the world’s leading Classic Race meeting – the Classic TT Races presented by Bennetts - got underway this evening on the Isle of Man. After a short delay to move cars from the course, the session got away at 5.40pm with an untimed lap for Classic newcomers before the session began in earnest with Superbikes and Lightweight machines the first out on the course. Dean Harrison enjoyed a mixed evening in the opening qualifying session while 23-time TT Race winner John McGuinness completed his first lap of the course since the 2016 Classic TT, appropriately riding the same Winfield Paton that he won the 2016 Bennetts Senior Classic TT Race on. In the opening Superbike session Harrison, belying the perception of Classic Bike racing, posted the fastest lap of the evening – 122.266mph - on his opening lap on the Silicone Engineering Kawasaki but he was reported as a retirement at Glen Duff on his second lap and missed the rest of the session. While Harrison was laying down his marker for the week, 2016 Junior MGP Race winner Andrew Dudgeon on a ZXR750 Kawasaki, Michael Rutter (Team Winfield) and Horst Saiger (Greenall Racing Kawasaki) all posted 115+mph laps on their first laps on the Mountain Course since the TT. Dudgeon’s 118.93 on the second lap was the second fastest of the evening, fractionally ahead of Saiger’s second lap (118.92). 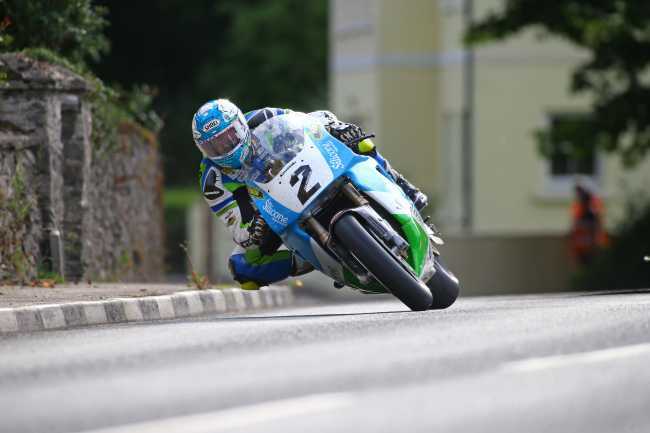 In the concurrent Lightweight Classic TT session rising road racing star Adam McLean posted the two fastest laps – improving his opening lap of 112.328 to 114.740 while Dan Sayle, after problems on his opening lap posted 109.671 on the Steelcote Solutions Yamaha. Conditions were deteriorating around the course with mist coming in ahead of the second session which was eventually flagged at the end of the opening lap. However, there was time for John McGuinness to make a popular return and the ‘Morecambe Missile’ showed that he had lost none of his ability after a two year absence with an opening lap of 104.95 in the Senior Classic TT session. Maria Costello (Team Beugger Racing/ Paton) and Olie Linsdell on the Flitwick Motorcycles Enfield also posted 100mph+ laps. 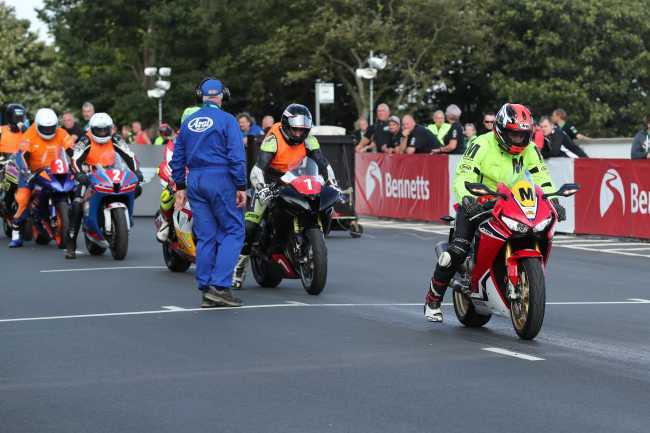 Hondas dominated the Junior Classic TT session with the Davies Motorsport pair of Dominic Herbertson and Michael Rutter topping the board – Herbertson with 99.71mph fractionally ahead of Rutter who posted 99.19mph. With all the newcomers completing their first laps, Monday’s session is due to get underway at 18.20 with Lightweight and Junior machines with the CTT Junior and Senior session scheduled to start at 19.10.
their speed-controlled lap of the Mountain Course. opening nights practice for the Classic TT.